Looks like carpet cleaning day Chez Guidarini. It seems I'm cleaning them every other month lately. Even then it's a futile effort. I clean them one week, then they're dingy looking again two weeks later. Is there a purpose to that? We'd love to replace the carpeting in the whole house, but with one of our two dogs still not quite understanding the difference between going inside and out, and three children who don't "remember" the entire house isn't the kitchen table, it seems futile. Yet, the carpeting is awful. I mean really awful. In spots there's no longer any padding. That's how cheap it is. And the owners before us had two or three big dogs who also didn't have the inside/outside thing down pat. Then, the boys' room… The mystery substances stuck permanently to their bedroom carpet would require a team of scientists to identify. We'll probably wind up replacing all the carpeting just before we move into our retirement home, so the next people can say, "Oh, what nice carpet!" Something about that just isn't right. It's like saving your best things so your heirs will have something sparkling and new. If they do the same, heirlooms will forever be passed down through the generations never used but always admired. And the point of that is? Meanwhile, we hold off on new carpeting, hold off on remodeling our groovy 1970s era bathroom, and the years slip right on by. At this rate we'll never reap the reward of a nicely updated home. Briefly onto bookish topics, the Nonfiction Book Group I lead at the library had our second meeting last night. 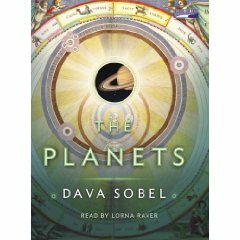 We discussed Dava Sobel's The Planets. Ever tried discussing a book of essays written in fanciful, poetic style? A tad difficult, I'm sorry to say. This wasn't a bad read, it's just hard finding things to say about it. The way she waxes lyrical about the mysteries of the Universe, approaching things from unexpected angles, sometimes works and sometimes doesn't. For instance, discussing Mars from the perspective of a Martian rock that hit earth, and bringing astrology into the mix with hard science and fanciful prose. I still don't know how I feel about it. The book gave me an odd feeling I can't quite explain, one I especially don't like when leading a book group. A little uncomfortable all around, but we made it through the hour, thank goodness. Next month's read should be better. 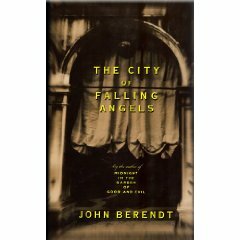 It's John Berendt's The City of Falling Angels. It centers on Venice, using the burning down of the Fenice Opera House as a starting point to discuss the city, the culture and the investigation into the fire itself. With Venice as a backdrop you can hardly go wrong. I hope. If all else fails I'll bring a couple bottles of wine, down them quickly, then regale them with the version of "Santa Lucia" I sang on a gondola ride through the city – to the horror of my future husband, sister in law and brother in law. Side note: the acoustics of Venice are varied and interesting. Ah, but I must away to do some house cleaning. Not often you hear me saying that, mostly because I almost never do it. If there's no one coming to visit I figure it's a total waste of valuable time which could be spent hanging half off my bed, staring at the ceiling. But the carpeting in the living and family rooms are sad enough to warrant even my attention. You know that's bad. Have a day filled with sunshine, lollipops, and unicorns friskily at play in flower-filled meadows. Sorry, the carpet shampoo fumes are getting to me.